August | 2013 | Can Men Cook? 8 cardamom pods – split them and get the little black seeds in the mortar and pestle again – a more earthy and completely different scent. Mix all this in a bowl, then pour over 8 chicken thighs (this recipe is for 4 people) in a shallow dish, and leave in the fridge for a few hours. The recipe has fried off chicken thighs (after the marination time), finely chopped red onion, fried, plus two large peeled tomatoes, and a large tin of chick peas (drained), plus about half a pint of chicken stock. It only takes an hour to cook – we served it simply with couscous (with fresh coriander leaves, loads of chives, some chopped up semi-dried apricots and a few flaked almonds). We also had baked potatoes – one of our guests (Eric) just can’t eat a meal without potatoes! Tagine’s are designed to work with very little water. The conical lid makes the cooking liquid condense and drip back down into the stew. Originating in North Africa, there was a need to conserve water, of course. Families used to have their own specific colour ways, so the cook of the family could take their tagine to the local bakers, and leave them in the oven while the bread ovens were still hot but cooling during the day. The colours meant you could find yours amongst the many when you went to pick it up. So, all well and simple – but not what I wanted to tell you! We knew it would be a late one (and it was) so we wanted Sunday to be at home and simple. 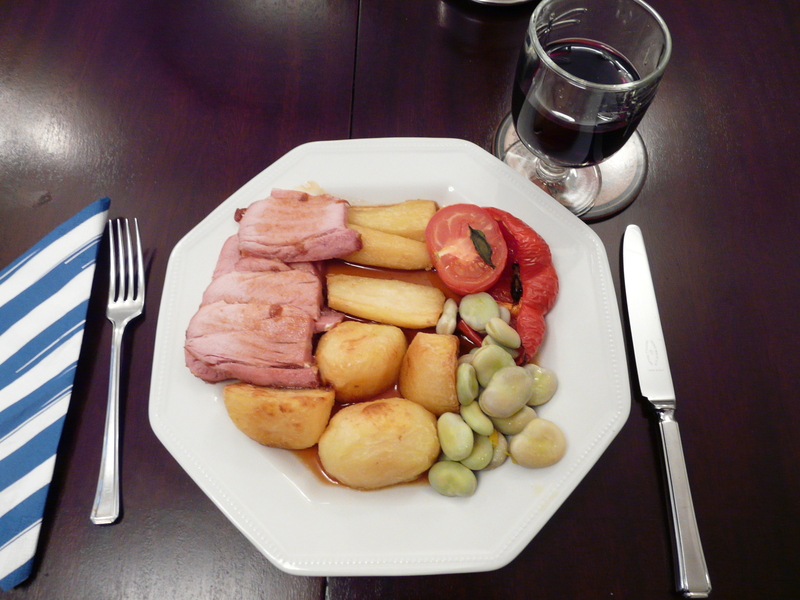 I cheated – M&S gammon joint, with a honey glaze. Cooks in 55 minutes, and we put all the other roast (spuds, parsnip, red pepper and tomatoes) in as well. It looks after itself. I did manage to get end of season broad beans (boiled for 7 minutes, drained and added a knob of butter plus lemon juice – try it!). Easy, tasty, fun, and enough left overs (which is one of my joys in life, as you know) for dinner tonight! From start to finish – 60 minutes – so just time for one of those other staples of Sunday – a swift half at our wonderful local, The Crooked Billet in Sheepridge Lane, Little Marlow.